My plan is to keep the two Bigs and use the poles for support, and let the cherry plants drape over the side of the container and off the side of the deck. Is this too much for the container to support ?? Yes, indeed WAY too much for the container. Do you know your Big Boy tomato plants are going to be 6' tall and 3' wide? 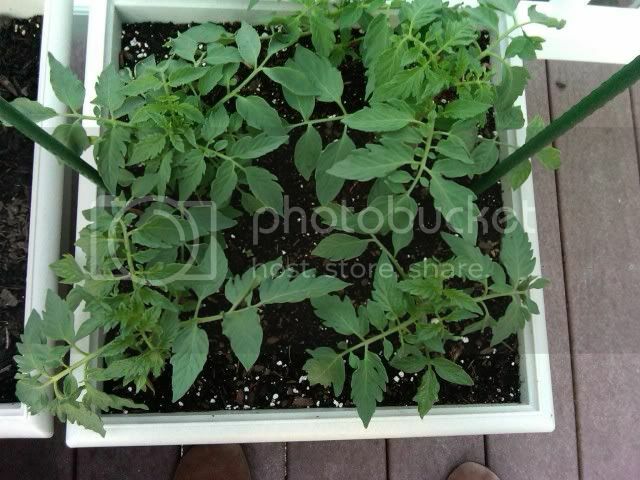 That's enough container for ONE tomato plant! Is it too late to dig them up without damaging the roots of the one I want to leave, or should I just cut them off at the soil level and stick them in some dirt to re-root ?? I'm not sure where I'll replant them, but I hate to lose one of my babies at this point after all that's gone into them. I've been trying to wait till the last minute possible to start thinning because i like having a few backups in case any start to dieoff. Sure, you can transplant them; they are smaller than mine were when they were moved from pot to ground (now they are starting to outgrow the tomato cages). Tomato transplants are very resilient, and can be moved around with no problems at all. It's amazing what i've put mine through, and they still lived. Ha! I say dig them up. They will be fine and so will the one that stay's. You can find somewhere else to put them. I wouldn't cut them off to re-root, though I just did this on accident and the plant came back amazingly. Is there any way to tell the Big Boys from the cherry plants ( something 100) ?? There is still little difference in the plants size so far, and the leaves are very similar.